Tonometry is one of the basic diagnostic tests used for the diagnosis of glaucoma and uveitis in veterinary ophthalmology. The Icare® Rebound Tonometer which is a new tonometric device has been shown to be useful in a wide range of species. Eyes (n = 48) of 24 Simmental and Montafon calves with a mean age of 7.5 weeks (2-16 weeks), male and female, were subjected to intraocular pressure (IOP) measurement using the Icare® Rebound Tonometer with calves standing and in lateral recumbency. The mean IOP was measured as 9.02 ± 2.38 mmHg in the right eye and 9.08 ± 2.55 mmHg in the left eye. No age-related change was found in intraocular pressure of the calves between 2 and 16 weeks of age. No difference in IOP values was observed between Simmental and Montafon calves. Body position had no effect on IOP in calves. The Icare® Rebound Tonometer was shown to be a suitable diagnostic device for IOP measurement in calves. Calves (n = 24), 2-16 weeks of age, 12 Simmental and 12 Montafon of both sexes, which presented to the surgical clinic of the Veterinary Faculty of Kafkas University for various complaints, but without eye pathology, were subjected to IOP measurement using the Icare® Rebound Tonometer by the same physician. Animals were not sedated or topically anaesthetised. Measurements were carried out when calves were standing and in lateral recumbency. The animals were manually restrained and the IOP values for both eyes were measured initially when the calves were standing. The animals were then placed in lateral recumbency; after 5 minutes when they calmed down, measurements were repeated. The calves were always physically held in the same position, right eyes were examined first taking care not to constrict the jugular vein or apply pressure on the neck region during restraint. Six measurements were made from the central cornea at each position, and the mean calculated IOP value was recorded. All measurements were taken during spring between 09:00 and 11:00. No significant difference was observed between IOP values of the right and left eyes while calves were in standing or lying position. The mean IOP values were determined as 9.45 ± 2.76 mmHg (right) and 9.20 ± 1.86 mmHg (left) in the standing position, and 8.58 ± 1.88 mmHg (right) and 8.95 ± 3.14 mmHg (left) in the lying position. The IOP values recorded in different body positions are presented in Table 1, while the mean IOP values obtained according to body position and breed are shown in Table 2. No age-related differences were recorded in the calves (2-16 weeks of age). Sedation and topical anaesthesia as two of the many factors such as measurement time (hour), breed, exercise, postural changes, medicines, blood pressure and seasonal changes (Çetin, Pamuk & Yaprakçı 2014; Gum et al. 1998) were eliminated by using the Icare® Rebound Tonometer. Çetin et al. (2014) conducted a study on young buffalo calves and assessed the results by making IOP measurements at the same time (hours) of day. It was reported that in this way they get safer results. Similarly, in our study, the measurements were made at the same time of day and in the same season, and then reference values were created. The mean IOP value in calves' eyes was determined as 9.05 ± 2.45 mmHg using measurements with an Icare® Rebound Tonometer in the present study. Tofflemire et al. (2015) measured IOP in calves with an average age of 11 weeks using a Tonovet® and reported the mean value as 15.20 ± 5.20 mmHg. There was no evidence that IOP was regularly increased or decreased in the age range that was assessed in the present study. However, when these two studies are taken into account together, IOP in calves is thought to increase with age. When the effect of breed factor on IOP is considered, the study conducted by Tofflemire et al. (2015) on Holstein breed calves is notable. 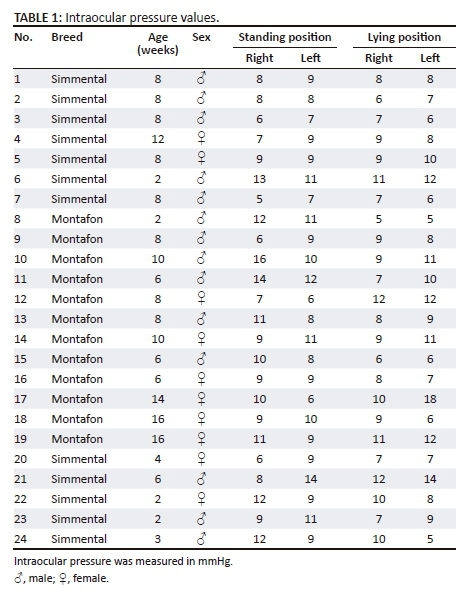 In the present study, Simmental and Montafon breed calves were examined and no statistically significant difference was found between IOP values in these two breeds. Although the IOP values obtained from calves' right and left eyes differed, these values were found to be statistically insignificant. Çetin et al. (2014) also found insignificantly different IOP values for the right and left eyes of young buffalo calves using a Tonopen-XL Applanation Tonometer. There are many studies on the effect of head position on IOP in humans. This effect is believed to depend on changes in episcleral venous pressure in people when changing from sitting or standing to supine or head down inverted positions (Friberg, Sanborn & Weinreb 1987; Galin et al. 1963). A similar effect was reported to occur in horses when their head positions dropped below heart level during feeding (Komaromy et al. 2006). Another study examining the effect of body position on IOP in dogs determined that pressure in the dorsal position was higher than sternal position (Broadwater et al. 2008). Galin et al. (1963) reported a difference of 2 mmHg - 4 mmHg in humans between sitting or lying positions. In the present study, no statistically significant difference was found in calves. The Icare® Rebound Tonometer has proven to be a suitable diagnostic device for IOP measurement in calves. It is well tolerated by calves and requires no sedation or anaesthesia. The mean IOP value obtained by Icare® Rebound Tonometer in healthy eyes of calves at 2-16 weeks of age in lateral recumbency or standing, measured in spring between 09:00 and 11:00, was determined as 9.05 ± 2.45 mmHg.